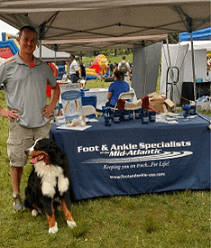 FASMA’s Clarksville Division Participates in Howard County Family Wellness Day – Foot and Ankle Specialists of the Mid-Atlantic, LLC (FASMA) podiatrists Kerry Becker and Casey Friske (Clarksville Division) participated in the annual Howard County Family Wellness Day event at Centennial Park on June 7, 2015. The event was held to promote healthy lifestyles, and included wellness screenings, activities for children, free workout demonstrations, and more. Drs. Becker and Friske educated attendees on common foot and ankle concerns. Dr. Kerry A. Becker attended the Johns Hopkins University in Baltimore, where she earned a Bachelor of Science degree, graduating with Honors. She then enrolled at the Scholl College of Podiatric Medicine in Chicago, Illinois. After earning her Doctor of Podiatric Medicine degree, she completed a two-year primary podiatric medical residency at St. Clare’s Hospital in New York City. She then completed a third year of residency, in foot and ankle surgery, at the University of Maryland in Baltimore. Since completing her training nearly ten years ago, she has been working as a podiatrist in Maryland, serving patients in the Baltimore and DC area. Dr. Becker has a special interest in the treatment of the diabetic foot, wound care, as well as foot and ankle athletic injuries. Dr. Becker is an active member of both the Maryland Podiatric Medical Association and the American Podiatric Medical Association. She is a Diplomate of the American Board of Podiatric Orthopedics and Primary Podiatric Medicine, and a Fellow of the American College of Foot and Ankle Orthopedics and Medicine. Dr. Casey Friske (pictured) graduated from Indiana University in 2004 with a double major in Biology and Criminal Justice. While at Indiana, Dr. Friske was a four-year varsity track and field athlete, competing in the pole vault. He then attended the Ohio College of Podiatric Medicine, where he graduated in 2010 with Pi Delta National Honor Society membership. Dr. Friske then finished his three-year surgical training at University Hospitals in Cleveland, Ohio, in 2013. His interests include foot and ankle trauma / reconstruction, sports medicine, and limb salvage. With Dr. Friske’s comprehensive and thorough training, he is able to treat foot and ankle problems in patients of all ages. Apart from podiatry, Dr. Friske has a vested interest in running. He has completed numerous marathons and triathlons.